New apprentices – The start of a new life chapter! We were delighted to welcome two new apprentices into our fold in early September 2018. 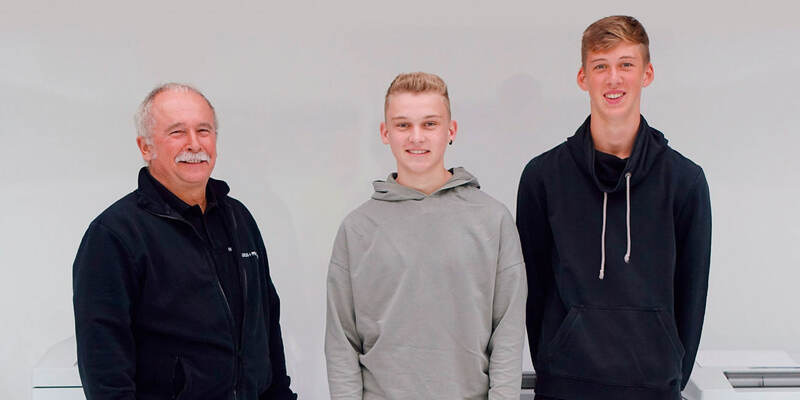 Max Kirschbaum from Bisingen (centre) and Timm Seifried (right) from Schömberg will spend the next 3.5 years with us training to become industrial engineers, specialising in tools and precision engineering. Head of Industrial Training, Walter Buck (pictured on the left) welcomed both youngsters and gave them an initial insight into our company by way of an extensive tour. "Training is a matter we have always taken very seriously. Ever since the company was founded, we have been taking on apprentices every year, because we believe in developing future talent from within our own ranks. Well-trained employees are the key to our long-term success and to our future as a competitive medium-sized family company", explain Dr Michael Walther (Head of Commercial Training) and Walter Buck (Head of Industrial Training). A warm welcome from everyone at Krug & Priester – we hope you settle into your career smoothly and wish you every success with your training!